Get to know one of our loan officers, Scott. Scott joined DMMCU as a loan officer in April 2013. He previously worked at Collins Community Credit Union in Cedar Rapids for over five years. 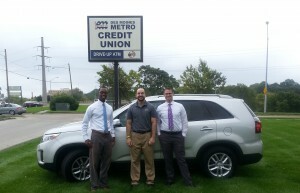 He has been a member of a credit union since his youth, and he understands the credit union philosophy. Scott can help you with all types of loans, but he really enjoys helping members finance and refinance auto loans. He can also help you with personal loans, credit cards, and home equity loans. In his spare time, he enjoys many activities involving sports and fitness, and he owns GitUFit Gym in Shellsburg. Scott has also co-written a comic book.